The MLA will once again participate in the AFS Annual Meeting, in Buffalo, New York, October 17–20, 2018, at the Buffalo Niagara County Convention Center. Greg Grazevich, Associate Director of Bibliographic Information Services and Senior Thesaurus Editor at the MLA, will present the bibliography as an essential resource for folklorists as part of a panel sponsored by the AFS Archives and Libraries Section, 04-12 “Beyond the Field: Library and Archive Research Tools for Folklorists” [Friday, October 19, 8–10 AM, Room 107]. In addition to covering search strategies tailored to the needs of folklore researchers, the presentation will touch on the new MLA International Bibliography with Full Text developed in partnership with EBSCO as well as the MLA’s free bibliography tutorial videos and online course. The MLA will also be staffing a table in the exhibit room. The new tutorial has been posted on Vimeo here. As Vimeo is not accessible in mainland China, it will also be posted on WeChat in the coming weeks. We are pleased to announce recipients of the 2018 Bibliography fellowships, who will serve from 2018 to 2021. Congratulations to the following! Bibliography fellows examine scholarly materials and submit citations and indexing information for inclusion in Bibliography. Fellows perform a service for the profession and receive institutional recognition while deepening their knowledge of their field, sharpening research skills, and exploring new areas of inquiry. Fellowships are for a three-year period, 1 July 2018 to 30 June 2021. The MLA provides training. On completion of the fellowship, fellows receive a stipend of $500 and a certificate at the MLA Convention awards ceremony. For fellows attending training sessions at the MLA Annual Convention, conference registration fees are waived. We look forward to working together on the MLA Bibliography! 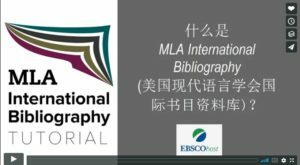 In January 2018, the MLA International Bibliography launched four new subject area modules to accompany its “Understanding the MLA International Bibliography” online course. Each module focuses on searching the bibliography for scholarly publications in one of four disciplines: folklore, linguistics, dramatic arts (including film, television, video, and other broadcast media), and rhetoric and composition. Students who complete the new modules can earn badges in each of these four subject areas. Visit http://mla.moonami.com to access the course and new modules. The online course and its accompanying modules are free and available for re-use and modification under a Creative Commons license. The initial course generally takes 90 minutes to complete; each of the additional modules takes about 20 minutes to complete. For additional information, please contact bibcourse@mla.org. The fellows, who have contributed to the bibliography from 2014 to 2017, will be awarded a certificate of accomplishment and a check for $500 during the 2018 MLA Awards Ceremony, which takes place at 7:00 p.m. on Saturday, 6 January, in the New York Hilton (West Ballroom, third floor). We offer our sincere thanks and appreciation for their service to the MLA International Bibliography! For more information about the fellowship program and how to apply, please visit the MLA Bibliography Fellowships Web page. This tutorial demonstrates strategies for Folklore research making use of the Bibliography’s extensive coverage of the field, achieved and maintained through our partnership with the American Folklore Society and Indiana University Bloomington. In a blog post published by EBSCO, MLA archivist Liza Young traces the beginnings of what is now the MLA International Bibliography. A timeline of the bibliography’s history from the 1920s to the present is available here. 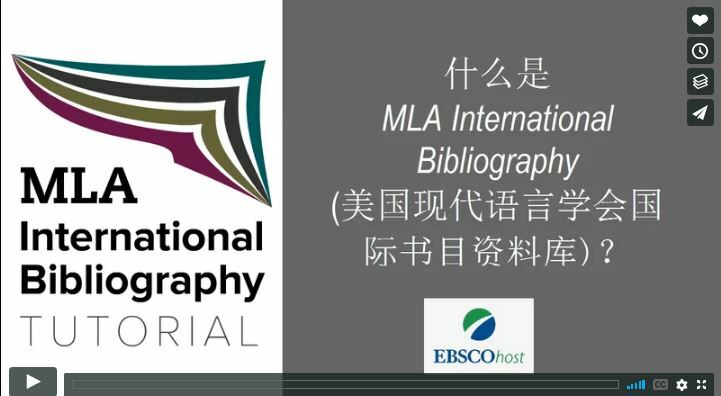 The MLA released today an online course to teach students the scope and purpose of the MLA International Bibliography and how to use it effectively for college-level research. Each of the five units in the course presents a lesson, followed by progression questions to reinforce the lesson through active engagement with the bibliography, and a quiz. Students will receive a badge upon passing each quiz and a course completion badge upon completing all of the lessons and passing all five quizzes. The course usually takes students 90 minutes or less to complete and requires access to the MLA International Bibliography through the institution’s library. For access to the course and related lesson plans and ideas for integrating the course into class curricula, visit the Teaching Resources on the MLA Style Center, or go straight to the course to create a free account and start earning badges. Please help us evaluate the MLA Directory of Periodicals by taking our survey. The MLA Directory of Periodicals provides detailed information on over 6,000 journals and book series that cover literature, literary theory, dramatic arts, folklore, language, linguistics, pedagogy, rhetoric and composition, and the history of printing and publishing. Articles published in works listed in the directory are indexed in the MLA International Bibliography.